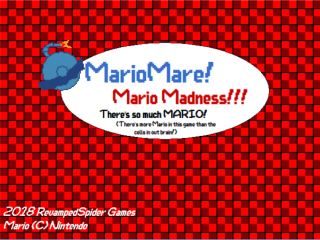 The demo only has 4 microgames and is endless. The full game was going to contain 12 microgames and 3 boss microgames, making for a total of 15. It is suggested to view this as a proof of concept. Mini games ideas are fun, but it's lacking some explanations, and the sound design is pretty boring. Otherwise, it's a fun game to test, keep going. Thanks for the feedback. i'll put minigame explanations (like "Jump!" when you'd have to jump). Also, what about the sound design did you find boring? I'd like to know. Please just edit sprites instead. The art's just placeholder for now. (in the cutscenes) No need to be rude about it. WarioWare isn't known for fantastic art anyways. No need to be rude about it. He put it as "the art...", which usually means that it's horrible and "cringy" (as that's what the cool kids say nowadays). Just remember to give me credit for the sprites. That's really cool! Especially since I didn't send it. There will be credits when I finish it. Nice sprite!